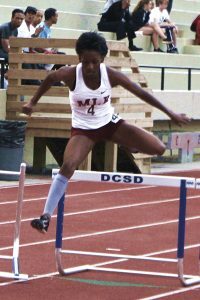 The Region 4-6A track and field titles reside in DeKalb County as the Martin Luther King Jr. Lady Lions and the Stephenson Jaguars raised the championship trophies this past week at Twelve Oaks Stadium in Hampton. A one-two finish in the 300 meter hurdles by King’s Tahleebah Martin (45.66) and Ayonna Dennis (45.73) paired with the 4×400 relay team winning gold in a time of 3:58.82 aided the Lady Lions’ run to the girls’ title 111.50 to 97 over Drew. The Lady Lions also picked up a silver in the 4×100 relay (47.90) just behind Tucker’s time of 47.70. Lauren Euler picked up a silver medal in the 400 meter dash (58.34) while Kayla Hunt finished third in the 100 meter dash (12.10) and fourth in the 200 meter dash (25.43) to qualify for the state sectionals. Zamaira Herrington ran to a bronze medal finish in the 1600 meter run (6:08.39) and a fourth place in the 800 meter run (2:34.17) to aid King’s charge to the top. Bronze medals in the high jump by Ayonna Dennis (5-00.00) and the pole vault by Kayla Sampson (6-00.00) added key points. Stephenson came in third with 95.50 points just ahead of Tucker in fourth with 93. The Lady Jaguars were led by a pair of gold medal finishes by Deanna Rawlings with her victories in the 1600 meter (5:57.51) and 3200 meter (13:24.21) runs. Jordan Williams was third in the 800 meter run (2:32.16), Kiomy Morris was third in the 100 meter hurdles (15.81) and a bronze in the long jump by Simone Harper (18-02.50) to go with a silver medal finish in the 4×400 relay (3:59.41) in Stephenson’s run to third. Tucker brought home four gold medals including Antonia Frazier in the 100 meter hurdles (15.14), Kayla Knight in the 800 meter run (2:26.68), Kaylah Lumsden in the 200 meter dash (24.58) and the 4×100 relay team (47.70). Lumsden also added a silver in the 100 meter dash (12.00) and Frazier collected a silver in the long jump (19-03.25). The Stephenson Jaguars led a 1-2-3 finish by DeKalb track teams at the Region 4-6A track meet at Twelve Oaks Stadium in Hampton this past week. The Jaguars piled up 114 points to outdistance Martin Luther King Jr. (94) and Tucker (88) at the top of the standings. Stephenson had a double gold medal winner in Donald Griffin with wins in the 1600 meter (4:51.32) and 3200 meter (11:1.76) runs. Jordan Sessoms won the 400 meter dash with a time of 49.88 and Justin Birdsong was first in the 110 meter hurdles (15.13) to pick up two more gold medals for the Jaguars. Previs Seldon won the discus (130-04.00) and was third in the shot put (46-09.25) for Stephenson. 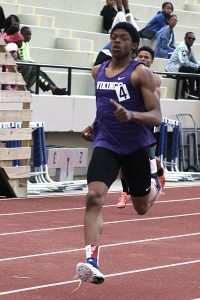 Jhivon Wilson won the 100 meter dash (10.79) and was third in the 200 (22.38) with Martin Luther King teammate Garett Mitchell winning the 200 (22.33) to lead the Lions into the runner-up slot. Tucker picked up four gold medals on the way to a third place overall finish with three of the gold medals coming in the field events. Joshua Vann won the long jump (23-06.50), Justin Mitchell took the triple jump (44-00.50) and Antonio Showers grabbed the top spot in the shot put (48-00.00). The 4×100 meter relay team also captured gold with a time of 42.52. All top four finishers at the region track meet advance to the Class 6A State Sectional at Lakewood Stadium in Atlanta on Saturday (April 29). The 1600 meter run and field events start at 10:30 am with the running events set for 3:30 pm. The Dunwoody Lady Wildcats qualified competitors for six events in this weekend’s Class 6A State Sectional with a sixth place finish in the Region 7-6A Track and Field Championships this past weekend. Ariel Lawrence picked up the only gold medal for Dunwoody as she took the long jump (17-09.250. Samantha Cameron qualified in both the 1600 meter run (5:17.73) and 3200 meter run (11:42.43) with a pair of bronze medal finishes. Walker Wicklund also garnered a bronze medal with her third place finish in the 100 meter hurdles (16.71). The Wildcats finished ninth in the boys’ meet while qualifying two competitors for the state sectional. D’Andre Kelley was fourth in the 300 meter hurdles (41.83) and Jeff Powell was fourth in the discus (122-07.50). All top four finishers at the region track meet advance to the Class 6A State Sectional at Heritage High in Conyers on Saturday (April 29). The 1600 meter run and field events start at 10:30 am with the running events set for 3:30 pm. The Lakeside Vikings followed up their second consecutive DeKalb County Track and Field Championship with a runner-up finish in the Region 7-7A Championships this past week. Lakeside finished second with 104 points to Parkview’s 186 and just ahead of Brookwood (103) behind a pair of double gold medal winners. Brian Herron won the 200 meter dash (21.02) and the 400 meter dash (47.62) to account for two of the medals. Gordon Lewis came away with wins in the shot put (46-11.50) and discus (137-00.00). Iman McCoy added the triple jump gold for the Vikings taking the event with a leap of 43-08.50. The Lady Vikings put together 41 points to finish sixth overall in the girls’ competition. Morgan Mihalis led the way with her silver medal runs in the 1600 meter (5:13.72) and 3200 meter (11:28.69) runs. All top four finishers at the region track meet advance to the Class 7A State Sectional at Mill Creek High on Saturday (April 29). The 1600 meter run and field events start at 10:30 am with the running events set for 3:30 pm.